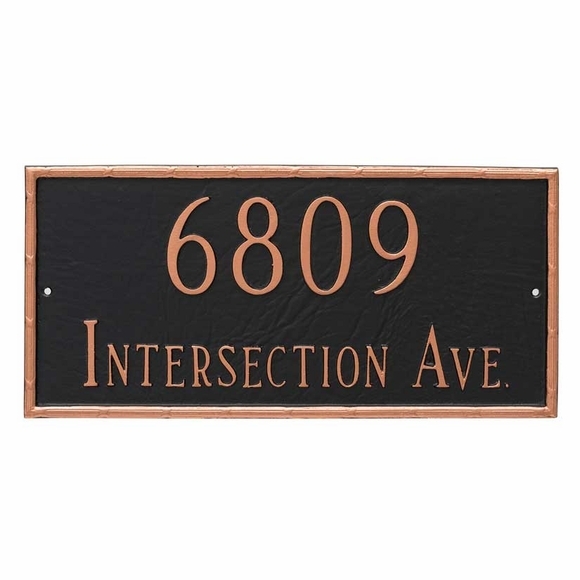 Personalized 2 Line Decorative Address Sign - - rectangle address plaque with traditional type of border. Rust free cast aluminum. Made in the USA. Traditional rectangular plaque with a formal decorative border. Solid cast aluminum construction. Characters and border are part of the sign, not added on. We live on a semi-circular street where the inner 12 houses have driveways and garages that face each other. Unfortunately, guests are not able to determine which house is which. The two line house number from Comfort House is perfect. Now, the other 11 need to order.